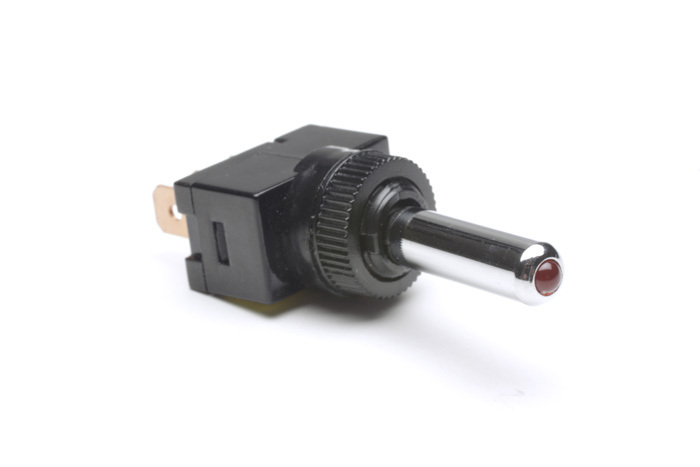 Short handle with LED Tip Toggle Switch. LED short chrome handle toggle is rated 20 amp at 12 volt DC. This Bat shaped handle, LED toggle comes in four colors; RED, GREEN, AMBER and BLUE. Switch, Toggle, LED, Chrome, Amber / ea. Switch, Toggle, LED, Chrome, Blue / ea. Switch, Toggle, LED, Chrome, Green / ea. Switch, Toggle, LED, Chrome, Red / ea.